Do you really want to be an author? I have to admit, though it's been a rough row to how, it's been a lot of fun too. Did you enjoy reading that excerpt I posted last week? I must have written and rewritten that scene 30 or 40 times. As I said before, I started this novel some 30 years ago. Hopefully it won't take you that long. Most of that time was spent trying to find an agent, but I also spent a lot of time writing and editing and rewriting until I got the book as good as I could. It helped having a critique group. My "Writer's Pen" group was a huge help. The members were all great writers. Some of them, like me, were eventually published. Some wrote fantasy. Some wrote horror. Some wrote science fiction. Some like me, wrote young adult coming of age. So, how did I begin? I think I started writing about this in my post a few weeks ago, but I'll take the chance I won't repeat myself too much. I began with a strong desire to write something. So, with a pad of paper and a pen, I began. At first, the only time I had to write was during my lunch breaks. And that has pretty much been the way it was ever since. Before I had access to a computer, I would leave my office and go down to my car and with oldies playing on the radio, I started jotting down some ideas. At first, I just wanted to write about my life in high school. But that idea didn't go very far. I had a pretty boring high school life, ha ha. Soon, I realized I was writing about my high school days, but no one in particular. Mark and Gary, Charisse and Genie, and Jeff and Bobby are all made up. I suppose if you were to examine these characters closely enough you'd see something of yourself in one or more of my characters, but I suppose that's the way it is with every novel. We all tend to identify with one or more of the characters in the story. So, where did I begin? I know I've said this before, but I started with a rough idea of a beginning and struggled to come up with a logical climax and ending. I read with relish a book by Dean Koontz called "How to Write Best-Selling Fiction." His training (if I can call it that) was wonderful. I read "How To" books from several other writers as well. All of them said to begin by plunging your main character into some kind of terrible trouble. Then, as they try to solve their trouble, they get into deeper and deeper trouble, until the ending when everything is resolved, hopefully happily. This post is getting kind of long, so I'll save more of this for later. I hope this gives you some hope and an increased desire to write. Like I said, it's fun and rewarding, even if it's a struggle at times. Good luck. Please remember to "Like" and "Share" this post if you're reading it on Facebook, or "Re-Tweet" it if you're on Twitter. 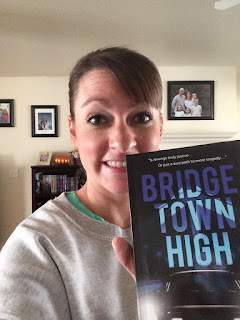 Also, for those who have read "Bridgetown High" or are in the process of reading it, a review on Amazon would be much appreciated.